Kooj Chuhan – Showreel from metaceptive media on Vimeo. Film, digital art, documentary and installation led by Metaceptive and Kuljit ‘Kooj’ Chuhan towards social justice, radical perspectives and cultural collaboration. Producing creative and cultural projects at all levels from broadcast and international exhibition to community engagement and education. In addition to a distinctive career spanning over 25 years as an independent artist and creative producer, Kooj Chuhan has produced work via Metaceptive Projects & Media for Manchester Museum and other museums, the NHS, Manchester United FC, Paul Hamlyn Foundation, Manchester University, LIME (arts and health agency), Community Arts North West, national charities such as ACE Centres and the YWCA. Kooj has also worked in schools, youth groups and other informal settings, and lectured in film production for eight years at Manchester Metropolitan University. Metaceptive projects + media has been the company name for productions by socially-engaged film-maker and digital artist Kooj Chuhan for many years. Kooj works as a film maker, digital media artist and creative producer including cultural development; a collaborative consultant for museums; and education, curriculum and learning development. He has worked with international artists such as Keith Piper and Shahidul Alam, yet has also extensively worked with many communities and was a senior manager at Community Arts North West and for Tameside MBC. He lectures in filmmaking at Manchester Metropolitan University and has exhibited and published across the UK and internationally, incl. festivals such as VIDEO POSITIVE, ISEA and SIGGRAPH. He served on the board for FACT (Foundation for Arts & Creative Technology) from 1998-2003. Films include ‘Raag, Glitter & Chips’ (1995), ‘No Trace’ (2007) and ‘Buy This’ (2013) and he has shown films at festivals including Kino (Manchester), Bite The Mango (Bradford), Fillum (London), Document (Glasgow), BlackScreen (Liverpool), Asian Contemporary Art Week (New York) and SAVAC (Toronto). His work often explores cultural and social issues from migrant perspectives with historical, global and local contexts. Artistic approaches include integrating documentary and fiction; non-linear narratives and interactivity; and post-colonial culture. He served on the board for FACT (Foundation for Arts & Creative Technology) from 1998-2003. 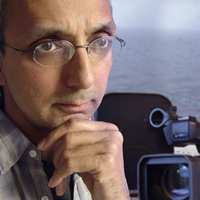 In 2011 he won a Beacon award for his pioneering work connecting refugees with issues of climate change using digital media arts. Kooj has founded and run a number of groups and organisations such as the Virtual Migrants artists collective focusing on race, migration and globalisation. He pioneered the video-dialogues method at Manchester Museum which facilitates co-production with communities; and worked with a partnership of eight museums and galleries on a major project about Manchester’s links with transatlantic slavery. Recent work includes the major Footprint Modulation exhibition exploring climate change, migration and global justice, devised, curated and managed by Metaceptive and Kooj Chuhan. Alongside his own interactive art work, the exhibition critically connected artists and cultural venues with researchers, activists, communities and documentary media to interrogate, expose, humanise and discuss the subject. He advocates education in its broadest sense and has worked as a teacher in a range of environments both formal and informal. Kooj has also previously worked as a scientist, a community worker, and as a professional musician. He is actively involved in various movements for positive social change. project is Tony Reeves at First Cut Media http://firstcutmedia.com/ . I’ll email you his email address separately.